Greetings, Bloggy Water Aerobicizers! Yes, I said 'Fwim' vs. 'Swim', just 'cause I wanted to. This is just a placeholder for today till I get back later - my class starts at 8 so I have to DASH! Okay, Okay, I'll write a little more and call it a day. Water aerobics class had a record turnout - FIVE including me! Well, to tell the truth, it's because three out of the five showed up to swim and the instructor invited them to join the class. We 'went around the room' and introduced ourselves - our class was composed of a chiropractor, a lawyer, a nurse, a teacher, and me - a computer geek. Then I went to the bank, went to the grocery store, and all that good stuff. We just finished supper, and we'll have vanilla ice cream sandwiches a little later. I'm on my third reload of the dehydrator - I'm dehydrating summer squash before it buries us. Each batch (several trays in the dehydrator) makes a one quart bag of dehydrated squash. 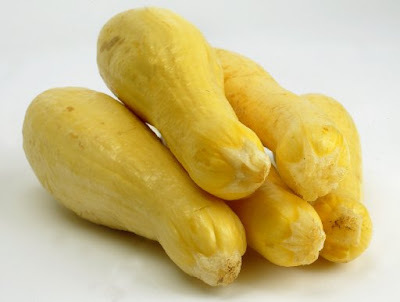 Dehydrated squash reconstitutes very well in soup and casseroles. Have a nice rest-of-Saturday! TTFN! I have to make this short, because I need to log on and check something that ran overnight. Have a great weekend, everyone, and Blog at ya later! Day 493 - Thursday and counting! It's Thursday - one more day (after today of course) till the weekend. I brought some summer squash to work yesterday to hand out to 'da gang'. I don't know if a single male took one, the women did though. I also had a 'special double' squash that was a large and small bloom that had grown together. I brought that one in for the lady at work who is expecting. It was a 'madonna and child' squash. SHE LOVED IT. Everyone who went by her desk yesterday commented on it, and laughed over it. By the end of the day she was thinking she shouldn't even eat it - she should dry it or save it, and she mentioned wearing it around her neck (as a joke). Very funny. It's amazing how much conversation can be generated by a few vegetables, isn't it? I get something called a macho salad, which is all vegetables, and then I get a tin of salmon on the side. I know it's "sahmon," but I like to say "sammin." Have a great day, everyone! Love you bye! It's already 6:07 so this is going to be short. I am SOOO busy at work right now, and there are a million projects going on that I am somewhat (or heavily) involved in. My meetings today start at 8am and run continuously until lunchtime. After that, I can't remember what the rest of the day holds. I was the only person at water aerobics yesterday afternoon, so I had my own personal trainer for an hour in the water. When we got through with OUR workout, she remarked 'next time we're using the double weights'. I've enjoyed eating out FIVE times this week (one meal at work, the Irish pub, dinner with friends, Cozymels, and Cracker Barrel) but gained a couple pounds for my trouble. Sheesh. YOU know who you are... don't you? I've probably mentioned that my mother will see someone in the small town where she grew up, usually at the grocery store or in a shop. At Cracker Barrel last night, we had a similar situation. An older gentleman, his daughter and her husband were leaving, and they walked by our table. The older gentleman stopped to speak to our friend, TY. 'Are you a Henderson?' he said. 'I'm a Brewer', the older man replied. 'Oh yes', said our friend. 'You knew my daddy - Buddy Y------'. His daughter introduced herself by telling who she USED to be married to (and our friends did know her too). She didn't bother to mention her current husband, standing beside her! TTFN! Have a nice Tuesday! Greetings, Monday morning Blah-gers! It's THAT DAY again. Count me in for the Monday morning blahs. Double blah, in fact. I have to make this short (again) because I need to get a move-on to work. The Fantastic Four movie - 'The Rise of the Silver Surfer' was entertaining. Charlie and I enjoyed it, then went out for Margaritas and Mexican food at Cozymels afterwards. Cracker Barrel night tonight, folks! TTFN! I just got back from the health club and we are leaving again to go see the 'Fantastic Four'. No time to blog, gang! Have a nice Sunday! Top O' the Morning' to Ye! Last night we went to meet a bunch of friends and former co-workers at a newly opened Irish pub in Franklin/Cool Springs. 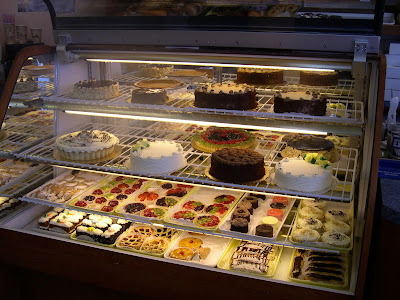 (This picture is from the photo album of their Nashville location). We visited, we ate (I had an open-faced Prime Rib sandwich, and Charlie had Shepherds pie), and visited some more. We listened to the first set of the Irish band, and we were the first ones in our group to leave after a mere two hours or so. For heavens sake, it was already 10 o'clock! I guess we're not the party animals we used to be, eh? The place was packed and we also noticed another bar called the 'Tin Roof' across the street. These places are new to the Cool Springs area. With all the people and businesses in the area now, it makes sense there would be 'after hours' places popping up too. How convenient that they are right near my new health club. Have a nice Saturday everyone! I'm on my way to water aerobics class! Day 487 - Friday Rolls Around Again! It's Friday again - and you know the drill. March in a circle, and chant 'Fri-day! Fri-day! Fri-day!'. That's it! You can do it! We already had a laugh this morning. I was making Charlie's lunch (a banana, raisin box, cheese nips, cookies, and a fat-free bologna sandwich with provolone). Charlie chuckled and replied; 'I would have said Fred and Wilma.' HA! Have a great weekend, everyone! TTFN! It's already after 6, so it'll be another short and sweet blog entry. How much of a head of iceberg lettuce is really USABLE? When you open it, you tear off about a quarter of it containing the core and those thick white pieces that are inedible. 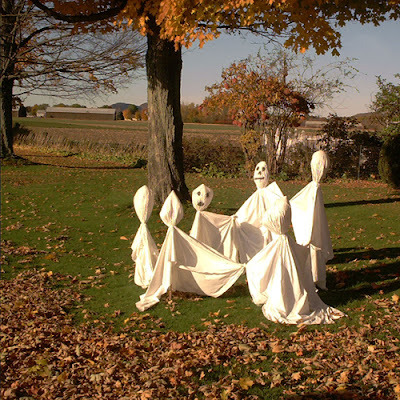 Then you take off all the outer layers that are either wilted or contaminated. Then you get a few layers (tearing off the inedible thick white pieces) of stuff for sandwiches. Then, you may or may not be able to peel the center - it may be so compact that the best you can do is chop it fine and put it in a salad. And I paid $1.29 for this? The worst ones are those that develop funny little brown lines that give the lettuce varicose lettuce veins. I just throw those away. I seem to use (vs. toss in the trash) a lot more of the romaine heart lettuces that I buy, except I cut off the very tops of the leaves that seem 'dry' to me. That's my story and I'm sticking to it. TTFN! 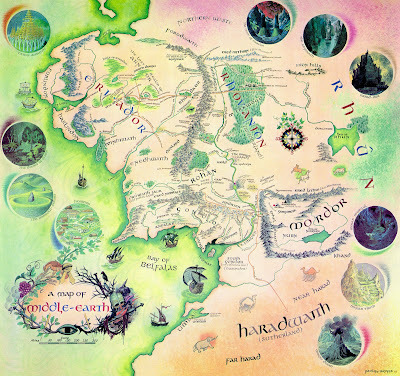 Today's illustration is a map of Middle Earth, evil Mordor in the lower right middle area. If they're going to build a Harry Potter theme park, why not a Middle Earth/LOTR theme park too? I want to spend a day wandering the halls and the Forbidden Forest at Hogwarts School of Witchcraft and Wizardry. I want to hang out with Hagrid at his hut and be invited for tea, served in gigantic, bowl-sized cups. Follow this trip with another day (or two or ten) at the Middle Earth theme park seeing Hobbiton and the White City and 'hanging around' the tree houses at Galadriels wood in Lorien with my man Haldir. Not to mention partaking of lots of ale at the party tree, of course. Greetings, Bloggy Forecasters! We had a speck of rain last night, and a chance of more rain today. Yesterday they said we are having the worst drought in 70 years, but they said on the news this morning it is the worst SPRING drought in 110 years. Well, excuuuuuse me! I'm going to make this short, because I'm out of time. Our internet connection was down when I came in here, and Charlie fixed it by turning everything off and on again. Why does it do that? 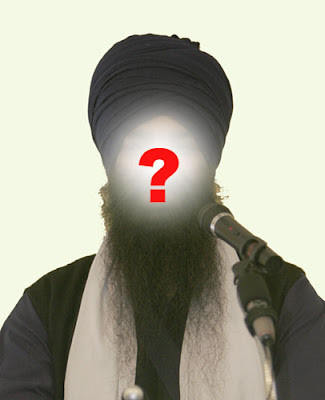 Apologies - I didn't even mention Fathers Day yesterday - what kind of blog is this? Charlie had 'done' Fathers Day last weekend with his daughter, and we went out for dinner then, so I didn't have it on my mind. For Aunt Nancy - we finished up the trout (there were 4 left) and some BBQ chicken for dinner. Side items - fried sweet potatoes, summer squash, cole slaw, three bean salad, corn light bread. Changing subjects - it is dark out this morning, teasing us that it might rain. We are TEN inches below normal for this time of the year. Charlie stopped at our regular vegetable place in Amish country on Saturday. I am sorry to report that he came back empty handed, two puny little cabbages the size of baseballs. No zucchini, no peppers, no onions, NOTHING. I hope they're working on a second planting! Our blackberries (that I make my jam from) have dried up too - this is the second year in a row with drought that the blackberry vines have not had rain. Good thing I have 'em in the freezer. I have also heard the blueberries won't have a crop this year. Good thing I have 'em in the freezer. I don't think I even mentioned there were no strawberries EITHER. Good thing I have 'em in the freezer. What would I do without that freezer, pray tell? Day 482 - Introducing the new Pool! I took my camera with me the other day to take a photo of my brandy new and much beloved outdoor pool. Isn't it the most beautiful thing? Brand new, and the water is so clear and nice. The kiddie area is the right hand side with the 'active water' features. The adult side is the left. Yesterday I went to the 8am water aerobics class. I was the only student, AND the only swimmer in the pool. I got out of class at 9 and went next door to the outdoor pool. NOBODY AT THE POOL YET. I'll be there soon, darling pool! A couple other tidbits from my visit to the health club yesterday. I finally ordered something at the cafe', and I paid cash for it, I didn't put it on my account. I tried an 'ABB Diet Turbo Tea'. I believe that when 'Turbo' is added to the name, they put a little caffeine in it. Anyway, it was good but expensive - $2.49. Last tidbit - my new CRV made a friend yesterday. It was parked near a quarter-million-dollar bright yellow and spotless Lamborghini Gallardo. Even rich people with fancy cars need to take their kid to the pool, you know! Day 481 - Trout, Anyone? It is heavenly not to get up until 6am. 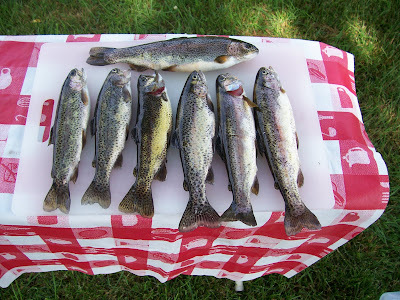 Charlie has had a couple successful trout fishing expeditions lately, and we have been enjoying the fresh fish very much. The upper photo is the catch from a couple weeks ago. 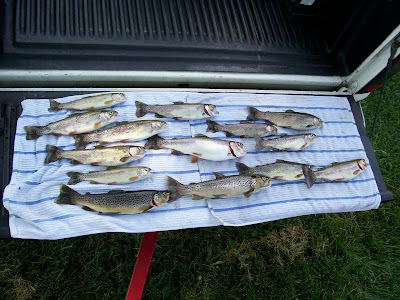 Yesterday, Charlie went fishing with TY, then TY and SY came over for a super-duper trout-fest. Appetizers - guacamole dip, hummus with pine nuts, and baked chips. Dinner: Lemon-pepper whole trout (without the heads, silly), grilled vidalia onions and baby summer squash from the garden, coleslaw, three bean salad, and cornbread. Oh - and let's not forget a couple bottles of delicious 'Crusade' wine from a semi-local (Keg Springs) winery. Did I tell you about our trip to the winery? I can't remember! Must be the wine! Anyway, this place makes the most delicious wine that tastes like homemade wine to me - it is sweet and rich and very grape-y. As you can see, the 'new' Blogger still messes up the formatting when I add pictures. I'm going to leave it as-is because I need to leave soon to go to the 8am water aerobics class! Day 480 - New Car, New Position! 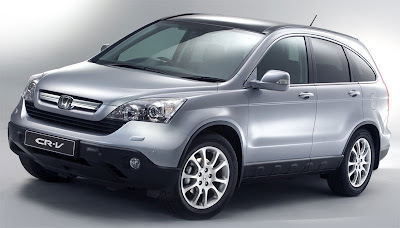 Drive in a circle today in honor of the new CRV, chanting 'Fri-Day! Fri-Day! Fri-Day!'. This is a photo I took at the health club yesterday. Beautiful, yes? Charlie is going FISHING today, hopefully we'll have trout for supper. Team Lead is a new role for me, so I will have a learning curve while I learn some management and administration activities. Oh joy - end of quarter is coming up in 2 weeks, so I need to get started right away, actually. Better get to it - enjoy the weekend, everyone! TTFN! Not the best photo in the world, but here is my brandy new CRV! I took the photo when I got home last night - it's snuggled up with Charlie's pickup in the garage. I think we could use a bigger garage! The 2007 model is a bit bigger than my old one. I hope to take more photos this weekend, and some interior ones. Yesterday at work I had three different groups of people go outside with me to go look at it and 'Oooh' and 'Aaaah' and remark about 'the new car smell', and that sort of thing. Okay - I'll tell an embarrassing story on myself about my first trip to work in the new CRV. The dashboard has a digital display panel in between the speedometer and tachometer - it has illuminated graphs for the gas mileage you are getting, a bar to show how much gas you have, and some other items like icons when your lights are on. A girl at work found a cubby hole storage compartment in the dash that I didn't know was there. Another girl at work showed me how the pop-down 'sunglasses compartment' works - I have my sunglasses in there now. Guess I need to read my manual, don't I? This is the same photo as yesterday, I haven't had time to take one of the NEW CRV yet. YES, I have my new CRV safe and sound in the garage. What a nice feeling, AND no more rental car. Where did I go for my first trip with it? To the health club. I was too excited to even swim for an hour, I swam for a half hour then lay on a lounge chair at the pool THINKING about it. Yes, I parked far away from any other cars in the health club parking lot. I have 20 pounds of more of car mats in my new CRV - three layers. No speck of dirt should be able to get to the new carpeting. There are the original car mats that came with the car (not the expensive ones), then my former CRV's car mats that I saved (that say CRV on the center piece between the driver and passenger seat), then heavy duty rubber truck mats. I bought the truck mats yesterday at Sams. 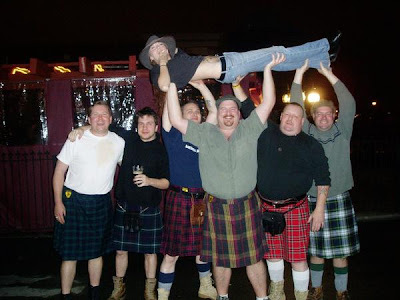 They were so heavy I had to get someone to lift them down from the rack where they hang - Charlie said they are the heaviest mats he's ever seen, I certainly think so. The dealership filled my new gas tank to full - that was a nice bonus after spending a lot of money. I had to ask them where the gas cap release switch is for when I do need to buy gas. Well, gotta go! I promise to take a picture and post it on TOMORROW's blog. TTFN! Day 477 - Hurry Up and Wait! I woke up this morning and immediately started thinking about my new CRV. Sheesh. No, I don't have my new CRV yet - the tinting place is backed up. Boo Hoo! Hopefully it will be ready this afternoon! That means I'm going to miss water aerobics class at 4:30, I guess I can live with that. This is a photo of a white 2007 though, whaddya think?? Beauteous Maximus, eh? No, I don't have the fog lamps or the sun roof, but I like the way they look! I just don't want to pay for them. Back to the gas station today at lunchtime to top off the gas so I can bring the rental car back full. 'Topping off' the nearly full gas tank yesterday was EIGHT DOLLARS. Good grief. I also need to buy some rubber car mats to go over the 'carpet' car mats - I always do that so I don't worry about wet or muddy shoes. Maybe I'll do that at lunchtime when I get my gas. Yesterday I had a LONG day, I am glad Monday is over with. I have a couple of meetings today and maybe the pace will be better. Day 476 - Out With the Old, In With the New! 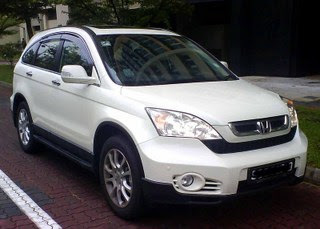 I hope my window tinting is done - if it is, today I will turn in my silver Ford Taurus rental car and pick up my brandy new Honda CRV 4-door color white! 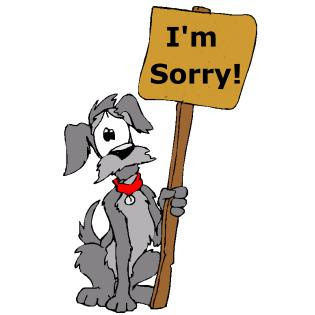 Interruption - I just checked my work email, and we've had a problem over the weekend. Gotta go! TTFN! Day 475 - What's new wit-chew? I am thankful today because it's been a week since our car accident and we are doing well. 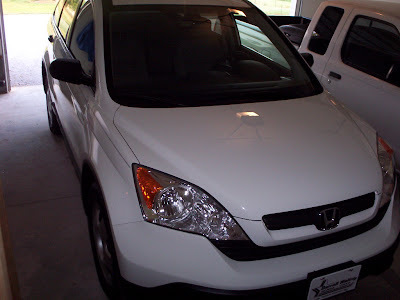 I am thankful today because I'm going to pick up my brandy NEW CRV tomorrow, providing the tinting is done. I am thankful today because we had a delicious, diet-busting trip to Papa Boudreaux's Cajun restaurant yesterday. The food was incredible. Yes, I ate all of my twin boneless chicken breasts with andouille sausage and cajun cream sauce over linguini. Oh, be still my heart, it was FABULOUS. I am thankful today because I am not sore from the water aerobics class I had at my new health club yesterday. I was one of two attendees. 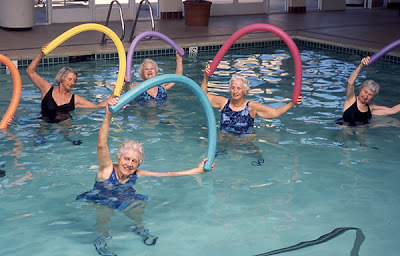 I didn't know they had Saturday morning water aerobics, but now that I do, I'll try to attend whenever I can. It was fun, my legs got really tired by the end of it, but I am fine today. I'll be heading off to the health club to swim and sun again today. Have a nice remainder of the weekend everyone! TTFN! I did it! I shopped, and I BOUGHT. I couldn't find a quick photo of a white one, but just imagine this one is white. 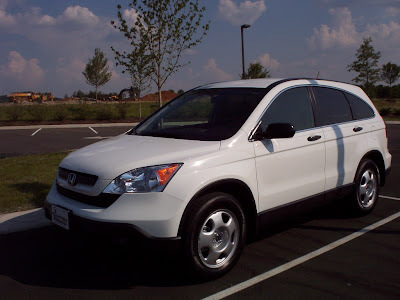 For LESS time than it took to have an accident and get home, I am now the proud owner of a 2007 Honda CRV, 4-door color white, AND 4-wheel drive. I am SO glad I went to my regular dealer. They had just received THREE (count them) THREE White CRVs, and one of the three was exactly what I wanted - automatic, power windows and locks, 4-wheel drive, cruise, cd player, etc. What I DIDN'T need were the fancy wheels, leather, moonroof, satellite radio, and other 'luxury' items that I don't object to, but don't want to pay for. THIS BRAND NEW ONE COST EXACTLY THE SAME AS THE USED SPECIAL EDITION THAT WAS TWO YEARS OLD! All the books tell me that 'new' isn't the best deal, to buy a car two years old. However, the used ones I looked at, due to all the added accessories and options that I don't need, were just the same price. Sheesh! I am estatic with joy to have a new one. YES, I did buy an extended warranty as well, to protect my investment and my new baby CRV. I just LOVE LOVE LOVE it. It just so happens the interior is GRAY, and the very expensive CRV car mats I kept from my other CRV are also GRAY. A match made in heaven, if I do say so myself. 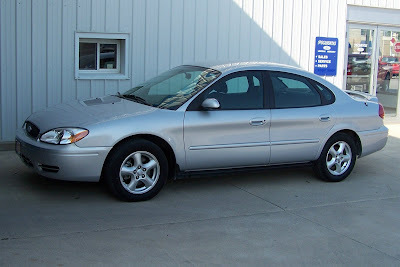 I am having the windows tinted this weekend, I should pick it up on Monday. Gotta go swim, bye for now! Love you bye! Day 473 - The Verdict is in - gotta shop now! Well, I have good news and bad news on the car front. Good news - things are moving along and I got a phone call yesterday afternoon that my car is totaled. Bad news - I am only getting $6900 for my beautiful CRV from my insurer. Good news - if I had tried to trade it in with 163,000 miles on it, I am sure they wouldn't have given me that much for it. Bad news - they say that once the car has been declared a total loss, the amount of time I can keep the rental car is reduced because there won't be repairs. I need to turn in the rental car THIS WEDNESDAY! That puts the pressure on to find something fast or buy new. Good news - supposedly my company has a 'corporate discount' program with my regular car dealership where I go for service. Maybe they'll have a CRV I want. Good news - I test drove the 2005 White Special Edition CRV at Drivers Way. It's nice, and it's a possibility, but it's rather pricey and I'd rather buy one from my regular dealership. That's it for now, folks! Have a great Friday and a great weekend! Day 472 - Foame' Latte', Anyone? 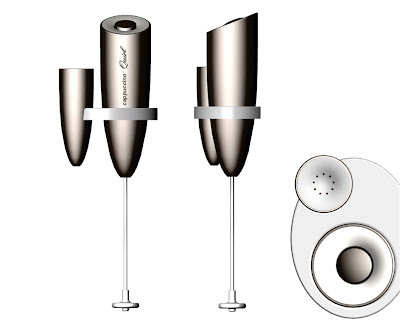 Charlie replaced the batteries in my milk frother (gift from CD, thank you!) and it is working really well. When he 'delivers' my lovely, foamy, frothy coffee to me he says 'Here is your Foame' Latte', Ma'am'. People at work are campaigning for others to join in to keep the Nashville Predators Hockey team in town, now that the ownership has changed. The new owner is a Canadian billionaire. I quipped yesterday - 'Save the Predators, eh?' with a Canadian accent. It was funny at the time. Tee Hee. I am going to be moving my seating arrangements to a window cubicle one aisle over, maybe this week. I like where I sit, and who I sit with - 'da guys', but I know I'll like this setup too. Anyone who knows me knows I LOVE LOVE LOVE having a window. It has a beautiful tree outside of it too. Aaaaaaahhh.... I dislike moving all my JUNK though, I wish someone would do that for me. Well, that's enough chatter for now! Have a great Thursday! Not much news on the insurance/CRV front yet. I did go to a 'Drivers Way' location yesterday at lunch to see what they have on their lot for CRVs. 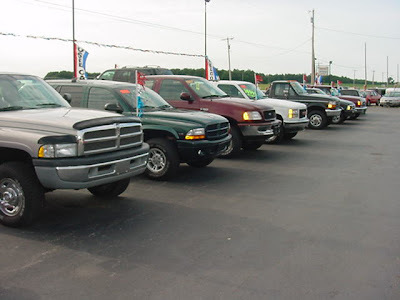 When I got there, I looked at CRVs, Nissan Muranos, a Mazda SUV, some Pilots, and some Jeeps. Drivers Way and Carmax are similar in that they have 'no haggle' pricing, vehicles are checked and are recent models without high miles, etc. They had one CRV I liked, but I didn't really care for the price, and with no-haggling, it's take it or leave it! I'm not 'seriously' shopping, YET. I definitely want to give the car dealership where I have all my services done the chance to sell me a CRV, because I already know I'll be taking it there for service. Again, don't know about the prices. I'll probably do best buying one from a private party, but you might not find exactly what you want on short notice. It took me a LONG time to get my first CRV, which I bought from someone in financial distress who was selling a next-to-new one so he and his wife could qualify to buy a house - they had two car loans and the bank didn't like that with their income. Their loss was my gain. Well gang, gotta go to work so I can earn the money for a newer model! TTFN! 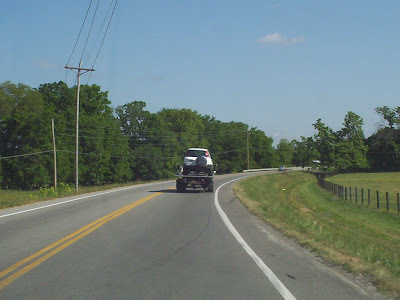 This is a photo of my CRV going for a ride to the collision center. Poor thing. I don't have much news yet, I'm waiting to hear more from the insurance company about whether it is going to be totaled or not. I might go look at another CRV during my lunch hour today. We took my rental car to our regular Monday night Cracker Barrel dinner out. It's nice, but not a CRV. I'm going into work for 7am this morning so I can leave at 4. Charlie and I have a date to go sit in the hot tub at the Club and soothe our necks and shoulders, then go out to eat. I have to make this short because the tow truck is here. We were in a bad wreck yesterday, and I think my CRV is totaled. More later, WE ARE OKAY. Update at noon: My car has been towed to a collision center about 20 miles away, and I have a Ford Taurus midsize rental car. Thanks, Charlie for driving me around this morning! We had RAIN last night for the first time in 'I don't know when'. We lost power for about 3 hours, long after the rain went through. We sorely needed it. I am cooking breakfast right now - I can be leisurely about when to go swim nowadays. Today's agenda - go for a Sunday drive, maybe go to a movie, and go swim. Debbie and I hung out at the pool in Nashville for THREE HOURS yesterday. It was very overcast so we just took our time. I did some shopping afterwards, and was home around 3. Gotta go turn the bacon, and we're having huevos rancheros with it. Have a nice Sunday! So! Inquiring minds want to know about my visit to the new pool yesterday. I left work early (the earliest I have ever left work). I went a different way to get to the Club than I did yesterday. The route I took past the mall was exactly 3.0 miles from work. Confession: I needed to ask DIRECTIONS to find my way out of the very large and multi-roomed ladies locker room area! (oops, I'll learn my way around). There is a big sign for other lost souls that says 'Clothes on after this point', so you don't accidently end up in the hallway half-clad! I bypassed the ladies lounge whirlpool, but I should have stuck my foot in it to see what the temperature was! I set up shop on a pool lounge chair outside. It was 90 degrees and a mix of sun and haze from the Florida/Georgia/Tennessee wildfires. You can smell the smoke in the air sometimes. 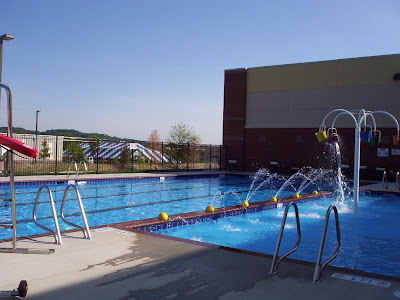 The outdoor pool has a 'walk-in' feature in the 'kiddie side' of the pool - a graduated decline into the water, then a few steps that separate the kiddie side from the adult side. The kiddie side has a continuous squirting water gun, buckets that fill and dump themselves periodically, and some fountain-type jets here and there. There were a couple of kids playing off and on during my visit. The outdoor pool was empty when I arrived. (There were a few people sunning, but not in the pool). I enjoyed hogging the pool until a very tan lap swimmer arrived. I just avoided the lane she was using. (there aren't any ropes outdoors, just lanes drawn on the bottom of the pool). Water temperature was 80 degrees, there is a thermometer floating between the kiddie side and the adult side of the pool. I swam, then lay in the sun for a while, then swam again, then lay in the sun for another while. It was lovely, and just what I wanted on a Friday afternoon. My buddy Debbie is meeting me at the Nashville pool at 9:30 to swim and lay out again. Day 466 - Happy June and Fit to the MAX! 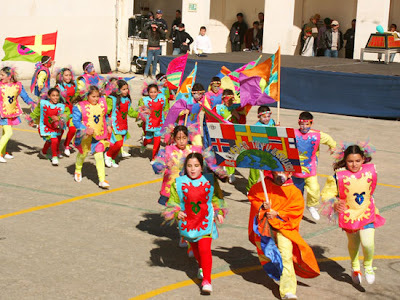 You know what to do - March (or float) in a circle, chanting 'Fri-day!' 'Fri-day! ', 'Fri-Day'! Happy June, everyone! It's time to change your calendars and see what picture you'll be viewing for the next month! Breaking news on the Fitness Front! My days of commuting 40 miles each way to swim for an hour at my 'nice' healthclub are coming to an end, especially with these high gas prices. I am now the proud member of THREE health clubs, until my other memberships expire. Today I went to visit a brand new 60,000 sq. ft. health club that has just opened (May 21) in Cool Springs. Go to www.prairielife.com to read about it. It's very near the mall and the grocery store and Dunkin Donuts, by the way. I stopped at the grocery store on my way home yesterday to get milk and potato chips. Not only did I visit the Prairie Life Fitness Center, I joined on the spot! The pools are awesome, the locker room is lovely with soap and lotion and body spray and such - it is very upscale and cushy. I went home with a membership, a t-shirt, a hat, and a water bottle too. Yes they have free towel service (with onsite laundry), and all of 200 members so far. They stock towels in the locker rooms, and you can also get a pile at the desk when you walk in. You can even rent a gym locker that has laundry service for your yucky gym clothes and sweaty socks to be washed between visits. There is a bathing suit 'dryer' that spins the water out of your suit so you don't have to drip home. When I went for a tour of the place after work, there was ONE person in the entire indoor pool, and NOBODY in the outdoor pool. (Do I hear Cheering?) There is also a large, rectangular 'co-ed' outdoor jacuzzi and a private, 'ladies' jacuzzi within the ladies locker room lounge area. 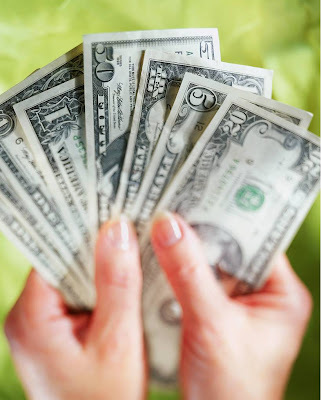 It is my understanding that the monthly membership fee covers all the classes you want to take. Classes include water aerobics, dance, regular aerobics, spin, pilates, yoga, etc. You just show up, no extra charge. There is a cafe and smoothie bar, and you can put your food on your account so you don't have to have money with you. Need I say more??? I am going there after work tonight to get IN the pool(s). TTFN!